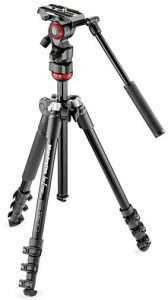 Upper Saddle River, NJ—Manfrotto launched the Befree Live—the smallest, most compact video tripod kit designed for portability in the Manfrotto range. Befree Live premiered in the U.S. at PhotoPlus Expo in New York City. Befree Live is designed to meet the needs of the emerging mirrorless and DSLR camera content-creator communities, including vloggers and also mobile journalists. It is suitable for both indoor as well as outdoor use. Manfrotto’s Befree Live foldable video tripod has all the characteristics of the Befree line. Among its distinguishing features, it boasts fluidity on pan & tilt as well as precise leveling. Furthermore, the pan bar is removable and foldable for portability. The tripod is engineered to reliably support a payload of 8.8 pounds, yet it weighs 3.9 pounds. It extends to a height of 59.4 inches and folds down to 16.5 inches. It also features a sliding plate for use with an array of camcorders, as well as mirrorless cameras and DSLRs. In addition, it has larger feet and a special hook for stability. Additionally, Manfrotto claims the Befree Live fluid video head is the smallest fluid video head available on the market. 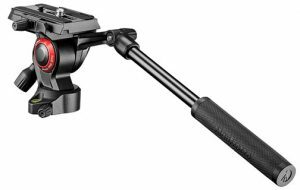 It provides fluidity on pan & tilt, has a removable and foldable pan bar on a very compact head, and is compatible with the existing Befree family, 290 Light and also all 40mm diameter tripods. The following Befree models will be available this fall: MVKBFR-LIVEUS, Befree Live aluminum, 4-section kit with Befree fluid head, $239.99; MVH400AHUS, Befree Live fluid video head, $99.99; and MK290LTA3-VUS, Befree Live fluid video head and 290 Light tripod kit, $169.99. · Manfrotto XPRO Monopod+ line. Their full fluid base brings fluidity to all three axes in a compact solution, to allow hybrid functionality for still pictures and video footage. · Manfrotto Befree Colors. Four colors were added to the tripod line, with larger feet and a center column hook for stability. 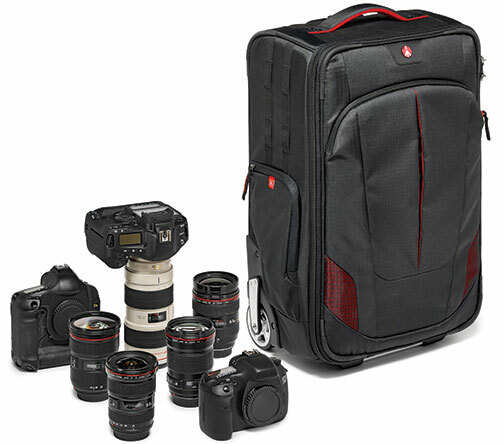 · Manfrotto Advanced and Street Compact System Camera (CSC) Bags. 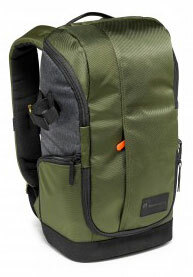 Five lightweight, stylish bags debuted, designed to carry CSCs, compact DSLRs, lenses and other equipment. ·Manfrotto Pro Light Reloader-55 Roller Bag. This international carry-on bag is geared for traveling photographers and also videographers. 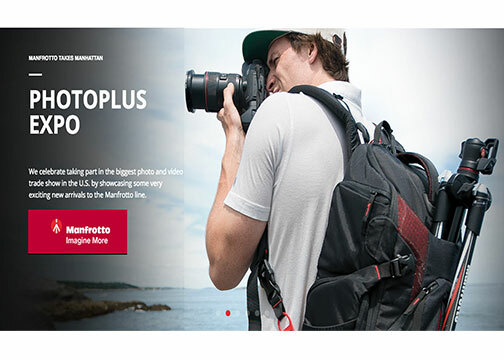 · Manfrotto Pro Light 3N1 Backpacks. These three-in-one carrying solutions are dedicated to commercial photographers as well as videographers on the go. · Manfrotto Lifestyle Windsor Collection. 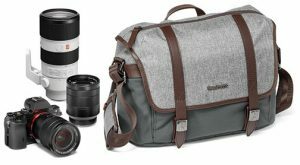 Four stylish photography carrying solutions feature genuine leather trim, premium fabric and metal details. · Manfrotto TwistGrip for Smartphones. The new accessory is designed to enable smartphone shooters to take better images and also video. Also on display at Manfrotto’s PhotoPlus Expo booth were the latest products from their affiliated brands: Gitzo, Lastolite by Manfrotto, Avenger, Xume Adapters, Bowens, Gossen, Metz and National Geographic Bags. · Gitzo Systematic Tripods & Monopods. 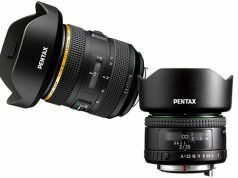 With new ultra-stable feet, this line is marketed to photographers who use long lenses as well as heavy cameras. · Xume Adapters. Boasting a patented magnetic system, Xume quick-release adapters permit photographers to quickly and safely lock the required filter on a lens—exactly when they need it. · Metz. The M400 flash, announced at photokina, is 30% smaller than traditional flashes and includes continuous adjustable LED and a new easy-to-use interface.